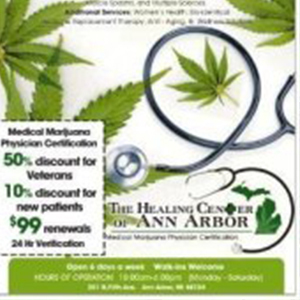 The physicians at The Healing Centre of Ann Arbor are trained and experienced in all aspects of medical marijuana. Not only are they able to recommend marijuana for qualifying conditions, they are also educated in medical marijuana legislation, specifically pertaining to the state of Michigan. The Healing Centre offer a holistic approach to wellbeing and concentrate on addressing the root cause of health problems rather than just treating the symptoms. The Healing Centre provide a compassionate, professional and discreet environment to make medical marijuana patients feel welcome and at ease.